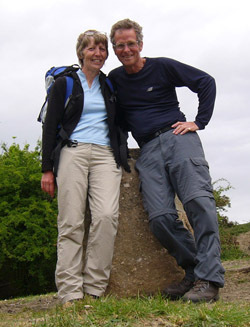 A chance invitation to join a walking holiday in Wales led Tricia and Bob Hayne to an interest that sees them reaching for their rucksacks as often as possible. From discovering the Buckinghamshire countryside to navigating Hadrian's Wall and encircling the Isle of Wight, they enjoy exploring Britain the best way – on foot. Tricia was for many years editorial director of Bradt Travel Guides and is now a freelance travel writer. She and Bob research and write Bradt's guide to the Cayman Islands, and have helped update several others. In 2007 they updated Trailblazer's walking guide to Offa's Dyke Path before setting out to tackle the Cotswold Way a couple of years later.